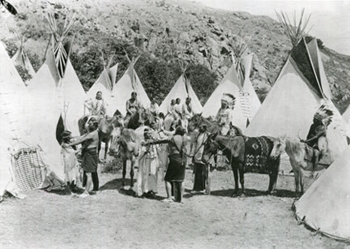 The Daughter of Dawn, an 85-year-old silent film about Native Americans, was recently restored after being lost for almost a century. The film follows a cast of about 300 Comanche and Kiowa people, highlighting traditional buffalo hunts and ceremonial dances. In true Hollywood fashion, a fictional tale of love stands as the central story line. Two of the actors were children of legendary Comanche chief Quanah Parker. Shortly after the movie’s original 1920 screening, the Dallas building which housed most of Texas Film Co.’s materials was ravaged by fire. The Daughter of Dawn was thought to be lost forever. Miraculously, a copy of the film was found in the possession of a North Carolinian by a private investigator in 2007. This copy was sold to the Oklahoma Historical Society for upwards of $5,000. Since, the film has been carefully restored and set to an orchestral score. It is currently kept at the Pickford Center for Motion Picture Study in Los Angeles and has been honored as part of the Library of Congress’ National Film Registry. The Daughter of Dawn was screened at the end of April in Texas. It is set to premier on a wider scale in late 2015. In light of recent coverage concerning the flagrant disrespect towards Native Americans exhibited in upcoming Adam Sandler film Ridiculous Six, it is refreshing to take in this Native film triumph. Media tends to present Native Americans and their culture in an oversimplified, ignorant manner. Even when positive coverage takes place, it is rare to see actual Native actors casted. The people presented in The Daughter of Dawn aren’t caricatures used to garner cheap laughs. A movie about Natives that doesn’t rely on offensive stereotypes and sensationalized storylines is something to applaud. The Lakota People’s Law Project hopes to see filmmakers interested in working with Native culture move forward with integrity. I really hope they put this film up on a big screen even if it is limited in which theaters show it. I’d rather see this than Adam Sandler any day and I’d pay to do so. I would happily pay to see it. It is always wonderful to have a chance to learn something new and important…to help us understand one another. Adam Sandler should be ashamed of himself, we Natives have been through way to much let him wanting to mock us. We take out culture very serious. I would pay whatever they will to see this 1920 film of my ancestors. More film should screen real life indigenous story unmolested. Like Yanga travel to MX. To save family from invaders non indigenous. Forced to leave Florida after leaving no choice but to retreat to Mexico. Near Veracruz. I would make it if I had proper finance and/or a commission to create production or documentary. RAVAGED by fire. Fire did not sexually violate that building. Thanks for pointing out this typo Stu… we changed it! I would be very interested to see the film, The Daughter of Dawn. I’m so tired of the fake stuff they show even in supposedly “realistic” films. The older the footage, the closer to authenticity it seems to be.